Verizon announced today that they will be releasing the Motorola Droid phone on November 6th. 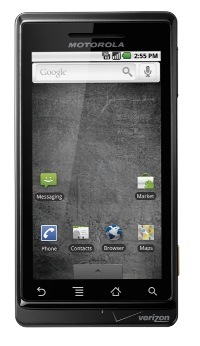 The Droid phone by Motoroal will be available Nov. 6 for $199.99 with a two-year contract and $100 mail-in rebate. Email and contact syncing with multiple accounts, from multiple sources. Quick Connect, which lets you tap on a contact photo and choose to call, SMS or email someone (shown at left). Lots of camera provements: flash, digital zoom, scenes, white balance, color effects, and macro mode.